I have been asked to do a talk and introduction to quilting. I only have two hours, can you suggest anything I could prepare so ladies could try their hand at patchwork. Congratulations! How about having the ladies cut 2.5" strips from an assortment of fabric and then showing the number of patterns that can be accomplished just by cutting the strips into different lengths? Like Rail Fence, Log Cabin, Bento Box, etc. Or handing out 8.5" muslin squares and having them make Spider Web or Strip Quilts with their fabric scraps? I know that when I first started quilting and attended my first class, the fact that I went home with something was very rewarding - doesn't need to be a completed quilt, but just a few squares of something that could be continued at home. Will the attendees be bringing their sewing machines? If so, you could have "kits" prepared for them to create a square. Or.. you could demonstrate quilting via a table runner. For me, it's fun to see how different fabric/colors can make the same quilt pattern look completely different. That might be something you could cover in your talk. Two hours isn't much time, and I can't imagine the organizers of the event expect you to do anything comprehensive. I would suggest picking a topic that you can focus on during that short time. Whatever you choose, for me having completed samples of quilts or quilted objects would be very inspiring. If you are doing a project, have some finished ones available, as well as samples in the various stages. The goal can be for people to walk away saying, "I want to do that! I can do that!" I think daylesewblessed as the right idea. Demonstrating what can be made with 2 1/2 strips and simple squares and HST. Would be easy and motivational enough for anyone wanting to learn. Also talking about how to pick a group of fabrics and using the color code on the selvages would be great info for any newbie. I think the idea of demonstrating a simple block is a good idea. Maybe taking several blocks and explaining how to make them. 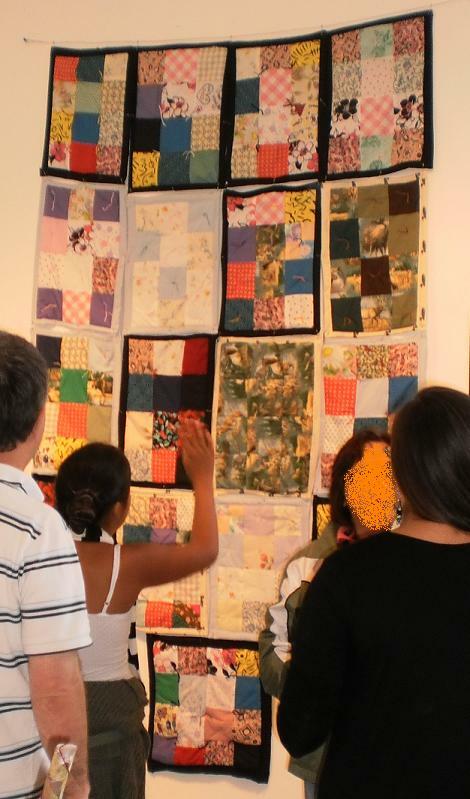 Another idea is to take several quilts with you and explaining the different techniques used to make them. I agree, 2 hours isn't a very long time to teach much. Maybe a history lesson would be useful. Good luck, and I hope they invite you back. My ladies and I were asked to participate in a Kids Summer Art Camp in August. We were supposed to be helping the students (ages 8 - 10) with creating "blocks" out of ceramic. The blocks were then supposed to be put together to represent a quilt. The day before the class, I got a call saying that none of the supplies had come in. I happened to have a box of 5" squares and a small lap quilt top. I suggested that the students could tie the lap quilt to show them how a quilt goes together. The day of the class we arrived and were given a tour of the facilities and shown all of the art work that the students had done so far. Once we saw that everything they had done so far was individual, we decided against having them tie the quilt. Instead, we would give them squares that they could hand sew together, sandwich and tie together to make a placemat. This way, they would have their own little quilts that they could take home with them. So, I piled all of the squares on a table and had them to pick out 12 squares. My ladies and I then began to instruct them on how to sew them together. We completed these in about 3 hours. (That includes time off for lunch, cutting up the backing and batting, and remember the kids were all between the ages of 8 and 10). This was all kind of a "flying by the seat of our pants" thing, since we had never done this type of thing before. We also machine bound all the little quilts. I think your ladies would be able to do this in 2 hours. There was another group of senior ladies that were supposed to be helping the students too, but somehow they wound up making a placemat too. 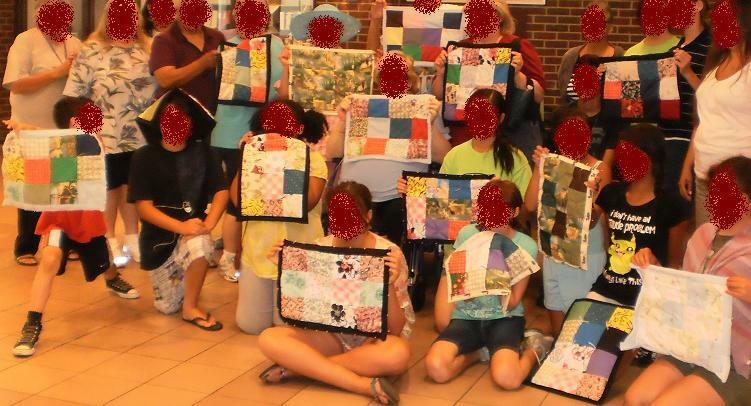 Instead of the just the 9 or 10 students making quilts, we wound up making around 23 little quilts. It was a lot of work, but everyone involved thoroughly enjoyed themselves. That is fantastic! I would have been a nervous wreck, having to change the plan at the last minute. Thanks for all the ideas, certainly got something to go on now. If not machines are going to be there how about english paper piecing .. the method with the hex templates. Or another that lends itself to handstiching is catherdral windows. Ask those attending to bring colored pencils or crayons and a straignt edge or ruler. Then you can provide the graph paper. That covers design and color theory simplified. The rest I would do as a talk with a the main points in writing to give to each person attending. Sometimes I leave room for the 'students' to write their own notes. Bring your own samples to show, such as: 4 patch, 9 patch, HST's, sandwiching, and binding. Maybe even include some sewing machine feet that they may want to consider using: 1/4" foot, 1/4" foot with flange guide, and open toed foot. Hopefully there will also be some nice snack foods for your 'students'. Somehow we seem to remember best when other memories are triggered. I would show how to use a rotary cutter and mat and different rulers. I was fascinated to learn how to do a nine patch by sewing strips together and then cutting them, say, every 2 1/2" and having all three pieces already sewn together. I thought that was a nifty trick. I would show the group how to do a nine patch. It's basic and I think everyone loves a 9 patch. I would show them the trick to making a triangle by drawing a line down the middle and sewing 1/4" on each side and then ironing it open. Or how you sew 1/4" all around a square of two fabrics and cut an X and make 4 triangles. Just showing them a couple of tricks really amazes people. It's so amazing when you are new. I would talk about ironing and piecing, how to properly iron when piecing. I would bring a quilt that is done and show everyone the binding and quilting done to it. Joyce888 - I'm not part of the demo but would sure love a 'lesson' on how to pick a group of fabrics and using the color code on the selvages. I've been quilting just under two years and haven't heard of this before. Would you mind? Make a small design wall. Use some of your squares to demo the many designs that can be made from them. Let your listeners try their hand at designing a quilt block, but give them poster board cut into the right sized squares and some Elmer's glue. They can see how the blocks go together and hopefully will then have confidence enough to learn to sew them together. It would be helpful to cover the basic tools need for newbies- scissors, rotary cutter , cutting mat, rulers, needles thread, sewing machine?, fabric, batting, etc. When I do demos at the group I bring my blocks for every stage of the process. squares before cutting, then cut, then sewn - and if there are multiple steps to sewing, I make a block for each step to show it off.. then one that is completed. If it is something that there are multiple ways to assemble the blocks to show off a pattern, I make enough to show off the different patterns. It's a lot of work but it does give me a bunch of blocks to be used for donation quilts down the road. What a great story! Look at all the new quilters you inspired. One little girl made me smile. She joined 3 blocks together at a time, so she had 4 sets of 3 blocks. When she went to join 2 of the sets together, one was longer than the other. She asked why, and i explained that it was because the seams were different, and that is why it is important to try and keep your seams even. She replied "I don't think the squares were cut correctly". There were two times that I introduced quilting to newbies; one was a group of adult ladies and the other was my daughter's 3rd grade class. Using muslin as the foundation, I had each person foundation-piece a house block. It was simple, the window, the wall above and beneath, side walls, a door, another wall, then rectangular roof with triangles on either side in sky colors. Then we sewed them pillowcase style, and "tie-quilted" with embelleshments--bird charms, flower charms, etc. The finished pieces were about 5x7 and really adorable.